When you design quilts as you go, you embrace serendipity and become an “accidental artist”. 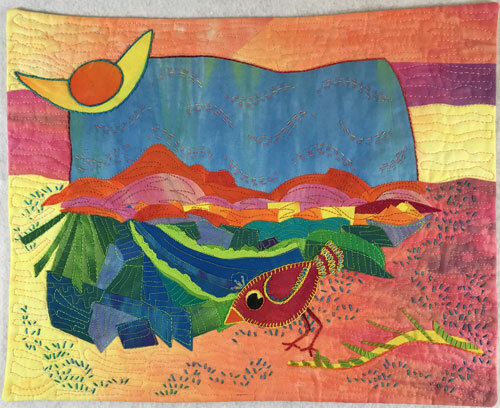 Learn several methods of creating fused quilt designs in an improvisational manner. Begin with a heap of pre-fused fabric scraps from Laura’s stash to trigger your design ideas. Learn various systems for constructing your artwork and put your colorful fabric kit to good use. You’ll create and learn as you go. It’s fun to design on the fly! $25 Kit Fee: Includes hand out, pre-fused scraps, hand-dyed fabrics and threads, and a needle. A bag of fused fabric scraps , like those above, from Laura’s stash is available for students to use. Following are some examples of methods of constructing a fused art quilt that will be shown in class. Building a vignette with design elements extending into the surrounding border. Building on a collage background. Building a set of color chip collages and combining them in abstract designs.